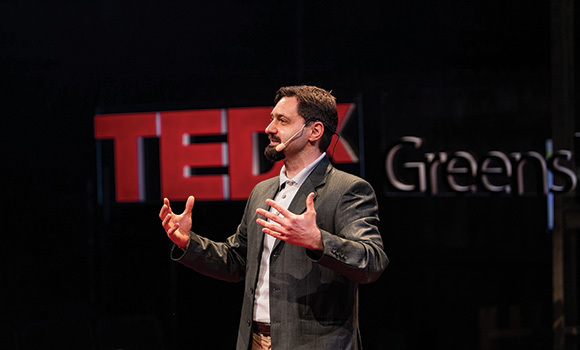 Dr. Vasyl Taras discusses X-Culture at a TEDxGreensboro event in 2016. Managers worldwide battle this issue. A team of capable people struggles, putting their project in jeopardy. The cause: One member isn’t pulling their weight. How can a manager resolve the issue? Better yet, which strategy is field-tested and statistically proven as the best approach? Dr. Vasyl Taras in UNCG’s Bryan School of Business and Economics has the answer, thanks to the X-Culture project. He launched the project in 2010 as a way to give his MBA students a taste of international business experience – before they plunge into the world of global commerce. That experiment has turned into an international success. Scattered about the globe, students work in virtual teams of seven. Their communication tools are email, Skype, Google Docs and Dropbox. They work across varied time zones, diverse cultures, preconceptions and prejudices. Results produced by the student teams are so well respected that companies ranging from Louis Vuitton to Home Depot have come knocking, seeking X-Culture’s expertise. “The whole idea behind X-Culture was that people would work with people from other cultures and would experience, in practice, what we are telling them in the classroom,” Taras says. Companies present real-life international business challenges to the teams. Students are evaluated on more than 100 performance dimensions. Getting – and keeping – a place on a team is not simply a matter of signing up. Students must pass a readiness test. Teammates assess one another weekly to ensure everyone is contributing. Companies receive well-researched, creative market-expansion strategies, while winning teams can earn cash prizes and even land consulting contracts and full-time jobs. In terms of scope and scale, there is nothing else like it in international business education. One team researched how a luxury Italian shoe maker might break into the U.S. market. The team interested a U.S. retailer in importing and selling the brand, convincing the shoemaker that entering the U.S. market was feasible. X-Culture has also grown into a versatile research tool for studying international teams and crowdsourced decision-making. Take those free riders, for instance. Now he can advise corporations on strategies for reducing free-riding, plus cite costs and benefits. Taras says the X-Culture project’s data is a rich and ever-growing resource, full of answers to questions yet to be posed. So he’s tossed out the welcome mat to researchers everywhere. This post was adapted from a UNCG Research Magazine story written by Tom Lassiter. To read the full story and more, click here.